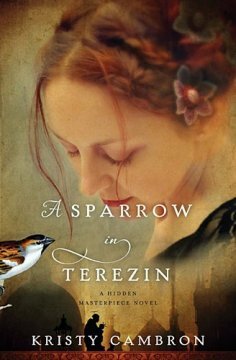 In Kristy Cambron’s A Sparrow in Terezin, the second novel in the A Hidden Masterpiece Novel series, two central female characters, Sera James and Kája Makovsky, bridge the gap between a past genocide and a present-day criminal investigation. Kája previously fled her home, escaping the Holocaust; Sera is dealing with a situation that may put her future husband in jail; and it is when these two stories find their crossroads, and these two women take support from one another, that the story becomes truly interesting. As a writer, I find historical fiction to be involving, but tricky. There is a certain line that has to be crossed, in the interpretation of history, filling in the blanks, and creating believable, realistic characters—but also there is the preservation of history to consider. Beautifully, this feat is attempted and achieved in Cambron’s novel, in which Kája’s escape and return to her home country, accompanied with Sera’s journey, is riveting. I apologize that this is a short review, but this novel is truly about the story, and I do not believe in spoilers. I recommend taking the time, slowing down, and reading this for yourself. The novel is somewhat narrative-and-detail-heavy in several places, but these moments are well worth it, as they offer a great amount of depth for the rest of the story. Kristy Cambron is certainly a novelist to look out for. NOTE: While I read Kristy Cambron’s debut novel, The Butterfly and the Violin, I did not review it and did not include it as part of my above review, despite A Sparrow in Terezin being its sequel, as a part of the A Hidden Masterpiece Novel series. KRISTY CAMBRON has been fascinated with World War II since hearing her grandfather’s stories. She holds an art history degree from Indiana University and has fifteen years industry experience as a corporate learning facilitator and communications consultant. Cambron writes World War II and Regency fiction and placed first in the 2013 NTRWA Great Expectations and 2012 FCRW Beacon contests. Her debut novel, The Butterfly and the Violin, was nominated for the RT Reviewers’ Choice Awards’ “Best Inspirational Novel” of 2014. Kristy makes her home in Indiana with her husband and three football-loving sons.